This presents the previously unpublished journal of the principal naturalist on Cook's second voyage. The main pagination of this volume and the three previous volumes in the set (Second series 152-154) is continuous. 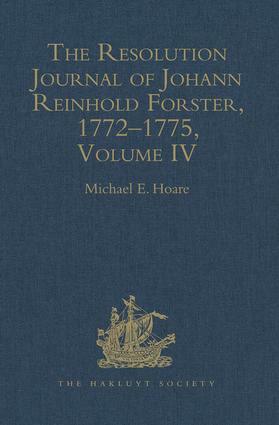 Overshadowed for nearly two hundred years in European scholarship by the achievements and reputation of his eldest son George Forster, J. R. Forster - principal naturalist on James Cook’s second voyage - was nevertheless recognised by many contemporaries as one of the ’universal geniuses’ of the late 18th century. His journal of the voyage offers many new insights, expressed at times in quite unrestrained language, into the day-to-day relationships, life and thinking and theory-testing on the second, and the most scientific and the most epic of Cook’s voyages. However, the circumstances of Forster’s career and personality were such that his work was dogged by debilitating disputes and vendettas. Consequently, important works such as this journal, which would have established him as the leading comparative anthropologist, linguist, geographer and zoologist of the Pacific, have thus far remained obscure and seldom-used manuscripts. Anthropologists, ethnolinguists, geographers, botanists, zoologists and medical and literary historians will find here much new observation and theory; for the two Forsters fashioned forces to influence Alexander von Humboldt and foretell Charles Darwin. This is a new print-on-demand hardback edition of the volume first published in 1981.